Whether you have a web site or just thinking of one, nothing is more important than creating a good solid strategic plan. You'll save money and get better results. Let Experienced Designs facilitate your next web meeting. "Leveraging the Power of the Internet to Develop New Customer Access Channels"
"Using the Power of the Internet as a Strategic Research Tool"
A premier coaching business, Success In Focus, wanted to bring the intimacy of one-to-one communication through email marketing. With its site already pre-designed, Experienced Designs kicked up the site's interactive marketing. 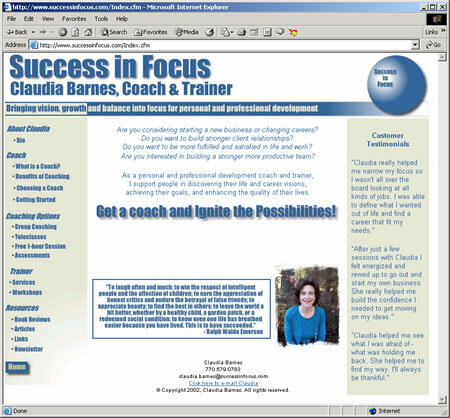 Experienced Designs developed an easy-to-use Email Command Center to allow Success In Focus to distribute its Ignite The Possibilities "e-zine" or email newsletter. It's easy newsletter registration, got web visitors signed up painlessly. Also many of the coaching sessions and classes required registration. 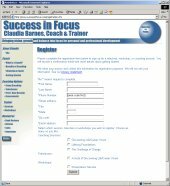 With registration forms, Success in Focus was able to gather all of the information it needed from its prospective clients and students. Experienced Designs also made the web site easy for its owners to update and keep current as well as linked them to revenue-generating sites.